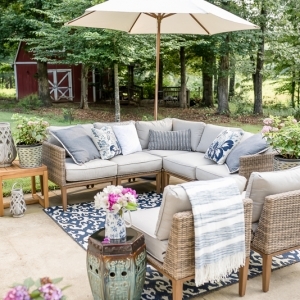 The temperatures are warming up and it is time to move the party outdoors! 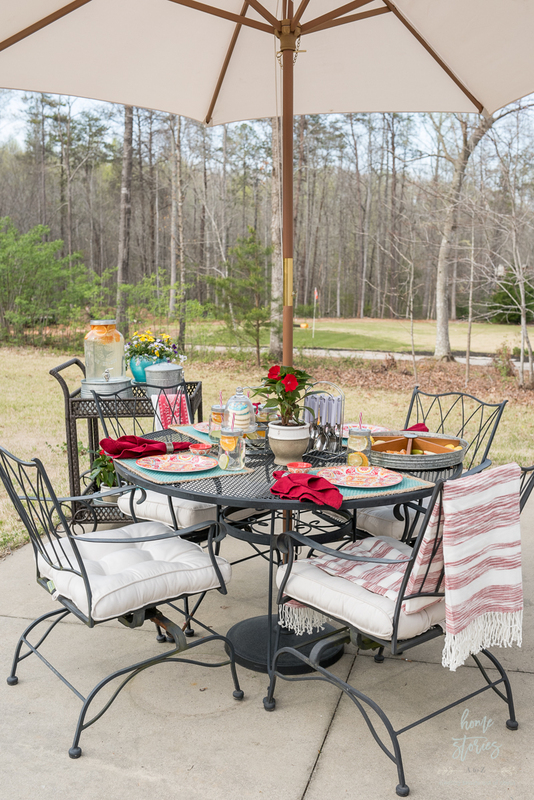 Here are 5 simple outdoor entertaining tips to help you get ready to dine al fresco. Our spring so far here in South Carolina has been a bit cold and erratic. Being new to the state I don’t know what is considered normal, but I’m really looking forward to consistently warmer temps! 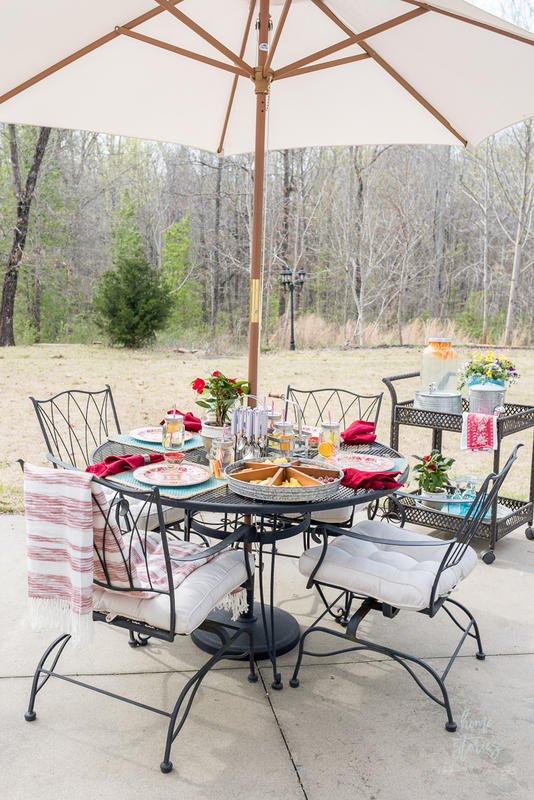 As you can see from my pictures, our poor grass is still a golden yellow and the leaves on the trees are mostly just buds; however, that hasn’t stopped us from enjoying our patio and dining outdoors. 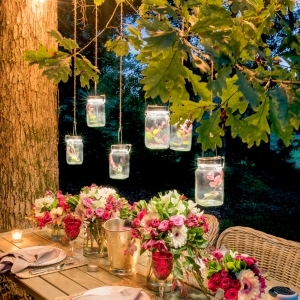 I’m a firm believer in making things beautiful but keeping things simple–and entertaining outside is no exception! 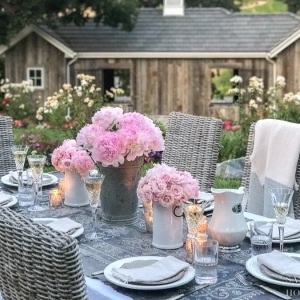 Here are my 5 simple outdoor entertaining tips to help make your al fresco family time easy breezy. 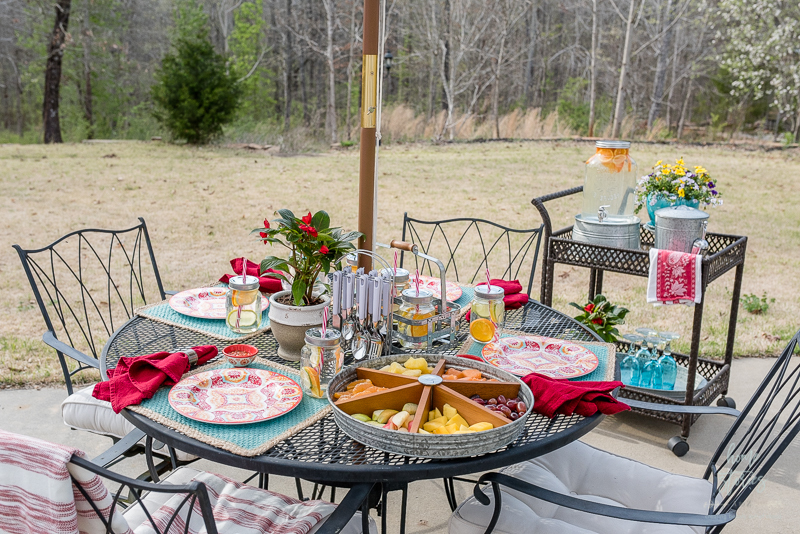 Simple Outdoor Entertaining Tip 1: Use melamine dishes. 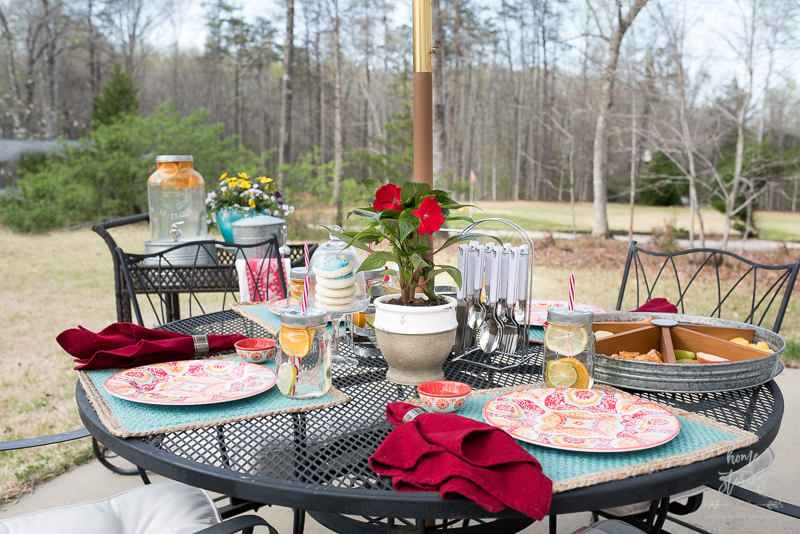 A step above paper plates and easier to manage than ceramic ones, melamine dishes are a wonderful option for outdoor entertaining! 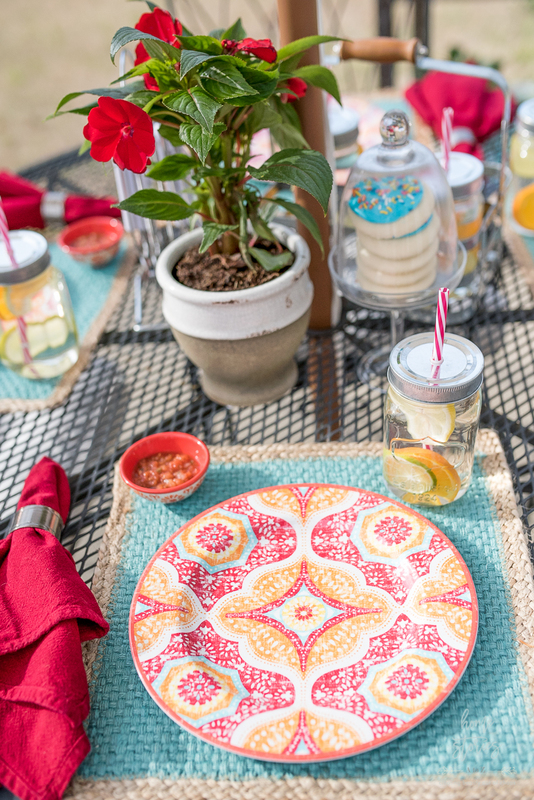 Little hands can manage these lightweight plates making them great for family gatherings. They are dishwasher safe and do not shatter easily when dropped. My Better Homes & Gardens at Walmart melamine plates can be found in store. 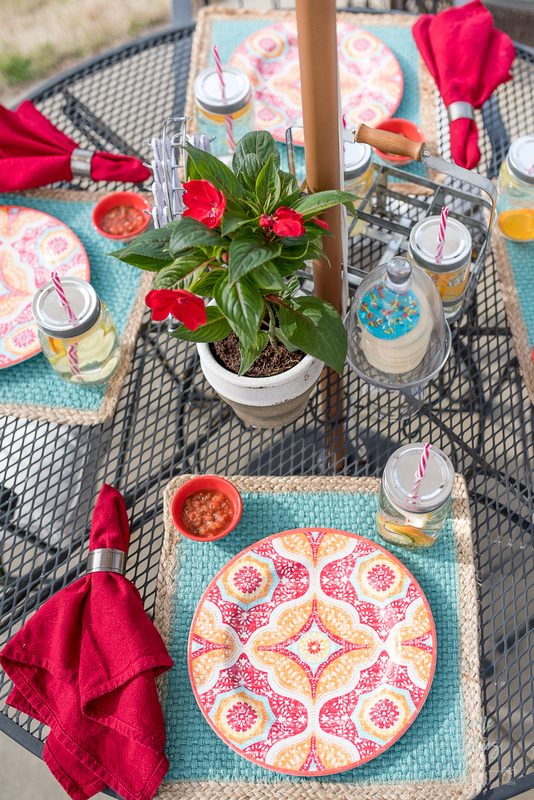 They add a fun pop of color to the table. 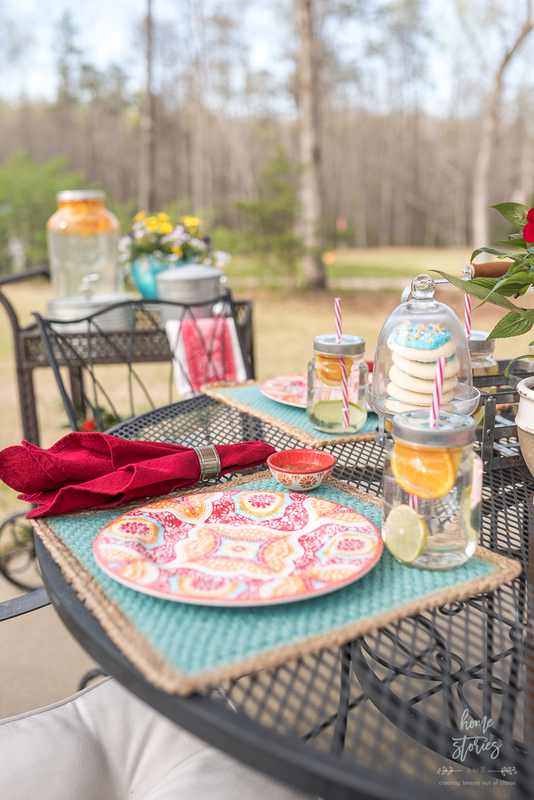 I paired them with the Better Homes & Gardens Jute Placemats which also can be found in stores. 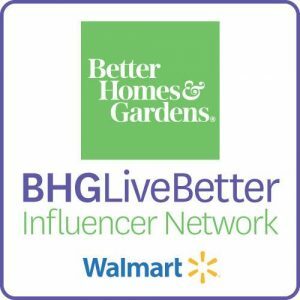 Better Homes & Gardens at Walmart offer a variety of melamine items online! Shop directly for your favorites by clicking on the pictures below that interest you. 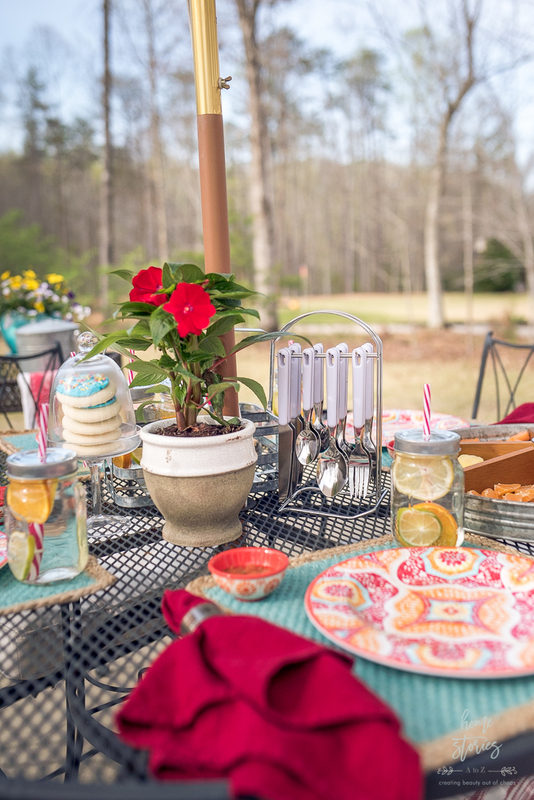 Simple Outdoor Entertaining Tip 2: Use a flatware caddy to cut down on table clutter and minimize cleanup. Sometimes you need a knife to cut your chicken and other times you don’t. Sometimes a soup spoon, or extra serving spoon is required and running indoors to retrieve one is a pain. To make things simple, I absolutely LOVE having a flatware caddy in the center of the table which allows everyone to grab exactly what they need–and more importantly not dirty-up flatware items they don’t! The Better Homes & Gardens 16 Piece Flatware Caddy comes in four different colors. You can shop the caddies by clicking on the pictures below. 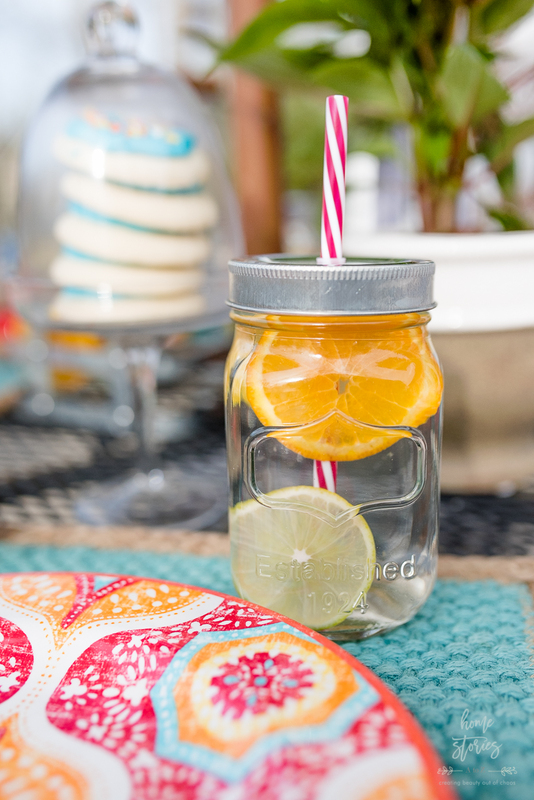 Simple Outdoor Entertaining Tip 3: Keep drinks contained and cute in mason jar drink holders. Infused water is refreshing and delicious and so simple to make and serve! Adding fruit to your water feels special and yet couldn’t be any simpler to make. I like serving our outdoor drinks in mason jars. The Better Homes & Gardens 7 Piece Mason Caddy is an adorable way to keep drinks spill proof and contained. The lids also ensure that sweet drinks stay bug free! 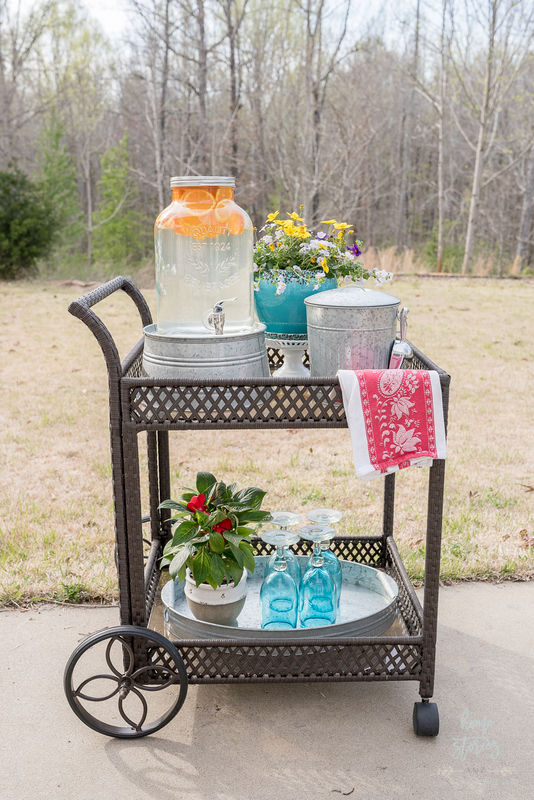 Simple Outdoor Entertaining Tip 4: Use a bar cart to create a beverage center. 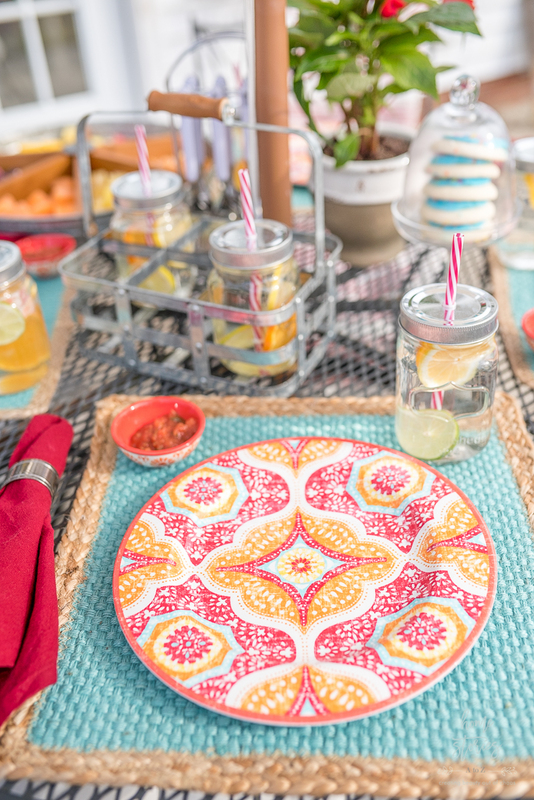 Better Homes & Gardens at Walmart currently has a huge collection of adorable galvanized outdoor entertaining products available both online and in stores! If a product is showing as out of stock online, I encourage you to visit your local store to see if it’s available. I like to keep a drink dispenser on a galvanized stand for easy pourability. I also love using a galvanized ice bucket for extra ice. A tray on the bottom shelf keeps extra glasses tidy! 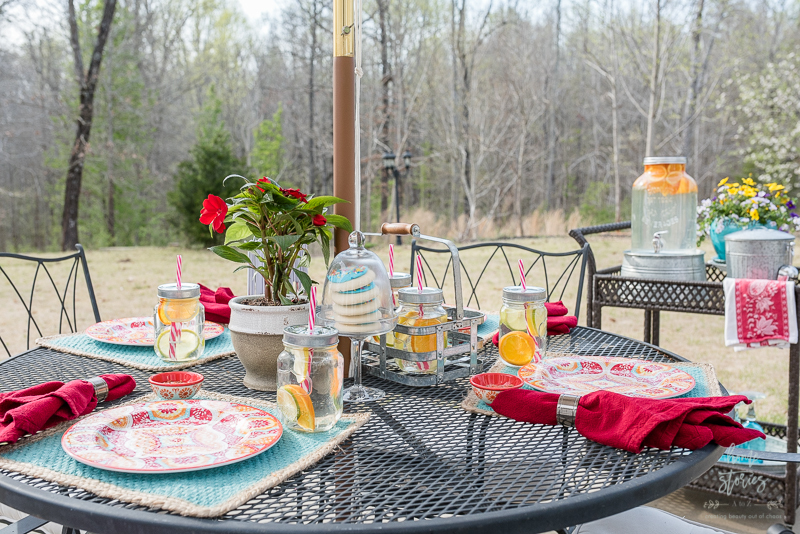 Simple Outdoor Entertaining Tip 5: Save space on small tables with a lazy susan. Our dining table serves our family well in the summer, but it is rather small and quickly becomes cluttered with serving dishes. The Better Homes & Gardens Lazy Susan Server is a great way to serve up multiple snacks or condiments in a small space. 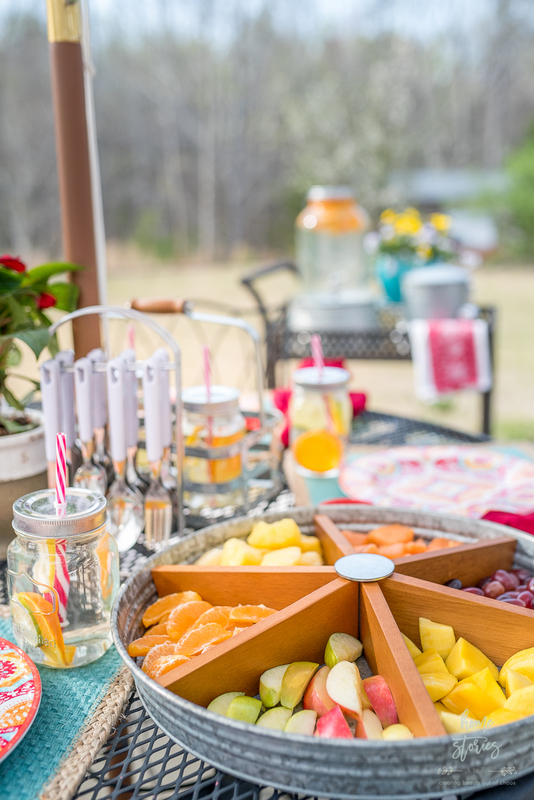 I often use ours to serve fruit, nuts, chips, and even ingredients for s’mores! What a beautiful display. You are so talented. Welcome to the South. You can’t beat Southern hospitality. I used to want melamine dishware until I learned that it can cause cancer.